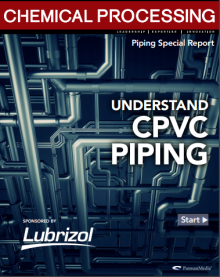 Stand alone Corzan® CPVC piping is inherently tough. Its high heat distortion temperature, impact resistance, and pressure rating can stand up to the demands of many industrial applications. That said, there are chemical processes that require corrosion resistance, but have a fluid temperature exceeding Corzan piping’s working range. For these situations, dual laminates are becoming more commonly specified. Dual laminates combine the superior chemical resistance of Corzan CPVC with the mechanical strength of fiber reinforced plastics (FRP). This translates to longer service life, lower maintenance costs, and improved reliability. Handling, storage and processing of corrosive or abrasive liquds and gases is a day-to-day challenge for the chemical processing industry. Engineers are confronted with a wide choice of materials of construction, including: Stand alone thermoplastic Glass fibre reinforced plastic (FRP) Dual laminate constructions with thermoplastics (PVC, CPVC, PE, PP) and/or fluropolymer liners (ECTFE, PVDF, FEP, PFA) Dual laminate technology offers greater safety making it one of the preferred solutions for demanding chemical applications. This is thanks to the combination of superior chemical resistance of thermoplastics with the mechanical strength of FRP.